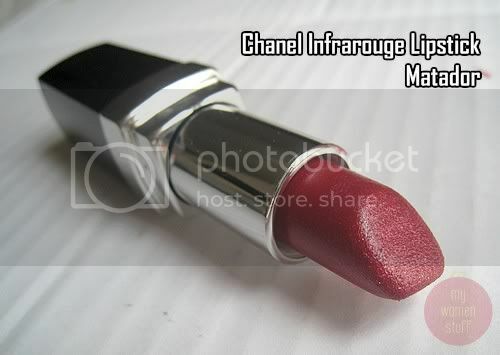 Day 4 of the 30 lipsticks in 30 days Project continues with another red lip with Chanel Infrarouge Lipstick in Matador. This is my one and only Chanel lipstick and may have been discontinued. I love this one for the colour – a deep solid red that is super glamorous especially when worn at night. The texture is not all that smooth going on but it is strongly pigmented with very slight shimmer so it isn’t flat looking. Even after the colour fades, a soft stain remains so if I just slip on some gloss or balm over it, I still manage to pull off a fairly decent look. The colour is a little deeper in real life – quite close to the colour in the tube. There is no scent which I like as Chanel products do have a tendency to be strongly fragranced. The colour is beautiful – as the name implies, its like the deep blood red cloak of a Matador as he faces down the bull in a Spanish bull fight. Moving on to Day 5 with Maybelline 3D Collagen Water Shine lipsticks. It looks very nice on you!